Class-action attorney Steve Berman is coming after a drug industry he says is “gouging” the American consumer. And his suits have the potential to crack the lid on the black box of drug pricing, shedding light on a secretive process that has sparked an escalating blame game between drug makers and the many middlemen in the US health care system. A key component in plaintiff-side litigators making the Lawdragon 500 guide is the impact of their cases. In this assessment, it’s hard to top the work done by Steve Berman, a master class-action attorney and the managing partner of Hagens Berman Sobol Shapiro in Seattle. “It may sound corny, but what first interested me in the law was the chance to right wrongs and change things that needed changing,” says Berman. When Steve Berman, a plaintiffs’ lawyer in Seattle, heard about the Volkswagen scandal, he quickly posted a video on YouTube urging vehicle owners to contact him. “We are going to launch a lawsuit on behalf of consumers against Volkswagen, and you are welcome to join,” said Mr. Berman, who has been involved in class-action lawsuits against carmakers, drug companies and the tobacco industry. After fighting court battles that put a little extra money in amateur athletes' pockets, augmented safety protocols in youth and college sports and allowed Volkswagen diesel owners to draw from a $14.7 billion settlement over emissions cheating, Hagens Berman Sobol Shapiro LLP partner Steve Berman has earned a place among Law360's 2016 Class Action MVPs. Ask most lawyers a question and 10 minutes later you’ll have to ask another. Ask Steve W. Berman of Hagens Berman a question and 10 seconds later you have to ask another. Conversation with him is less a leisurely round of golf than a rapid-fire game of pingpong. How many cases is he involved in right now? “Probably 40,” he says. The National Collegiate Athletic Association is expected as early as April to reach an agreement to boost safeguards for athletes who get concussions while playing college sports. 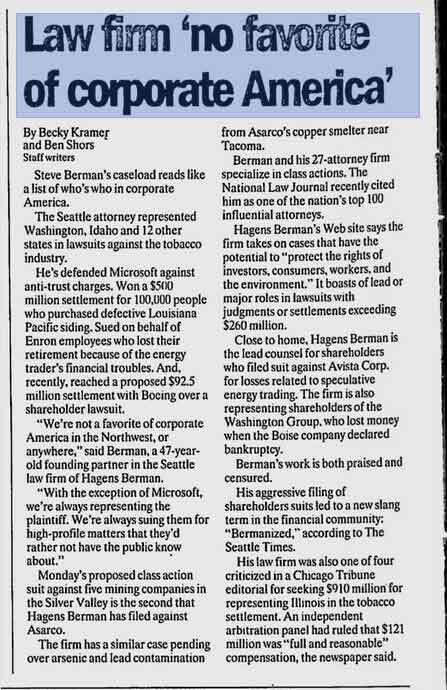 Driving the deal is 59-year-old Seattle lawyer Steve Berman, a onetime college soccer goalie who has brought successful group actions against Big Tobacco, Enron Corp. and Toyota Motor Corp.
Steve Berman's caseload reads like a list of who's who in corporate America. The Seattle attorney represented Washington, Idaho and 12 other states in lawsuits against the tobacco industry. He's defended Microsoft against anti-trust charges. Won a $500 million settlement for 100,000 people who purchased defective Louisiana Pacific siding. Sued on behalf of Enron employees who lost their retirement because of the energy trader's financial troubles. And, recently, reached a proposed $92.5 million settlement with Boeing over a shareholder lawsuit.